Location: Tyhee Lake is located just east of Hwy. #16 at the community of Telkwa. Ice Over November to April T.D.S. 208 mg/L. 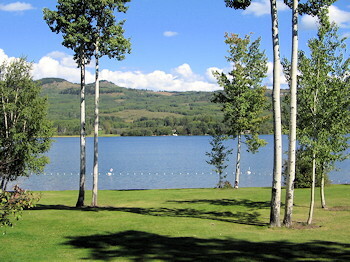 A beautiful Provincial Park is located on the west side of the lake. It contains 55 aspen forested vehicle campsites, flush toilets, hot showers, sani-station, playground, beach and swimming area and boat launch. Resorts can also be found on the lake. Other services and accommodations can be found in the nearby communities of Telkwa and Smithers. Trolling with spoons, wedding bands, flatfish and spinning gear will net you Rainbows up to 4 lbs. and Cutthroat as much as 2 lbs. Fly fishing is also very successful in the shoal areas. This small, beautiful lake can get very busy on summer weekends, and fishermen will have to share the lake with ski boats, sea-jets, canoes and kayaks, however after supper the lake is often very quiet and the fishing can be very good. 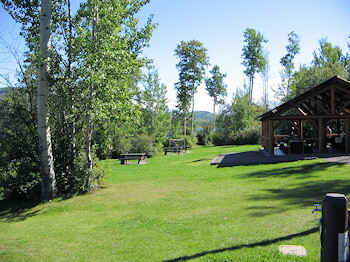 Tyhee is an excellent all around family lake situated in the middle of the fantastic Smithers recreational area. Round Lake - Round, a small lake of 182.12 ha. (449.8 ac.) is located approximately 10 km. (6.2 mi.) southeast of the community of Telkwa off Hwy. #16. Round is a good producer of Rainbows, some reaching 4+ lbs., and Cutthroat up to 2+ lbs. Flies work well, as well as trolling with various lures. Cartop boats can be launched.